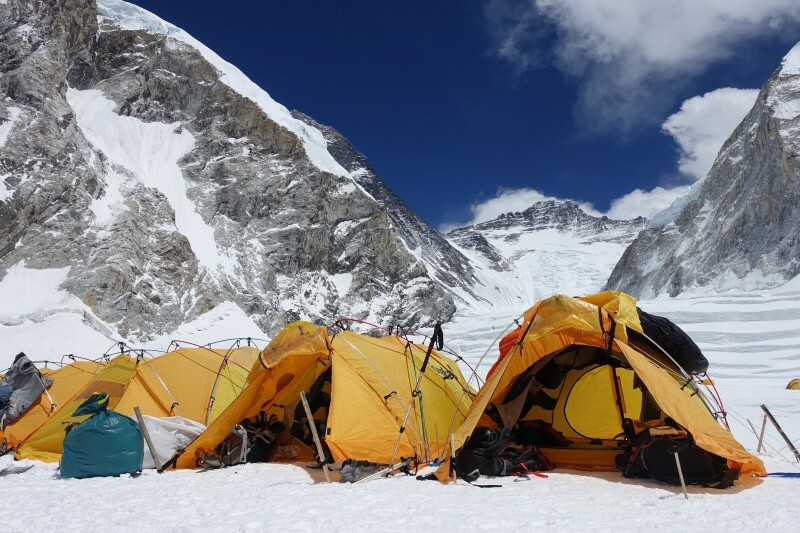 News was good: Camp 1 was built and ready for us. Or, if not totally built, at least built enough for us to get up there. Because weather was favorable, we were eager to make the next step and get the rotation done. The plan: Climb to C1 and stay two nights, then move to C2 and stay there two nights, then come back to EBC. 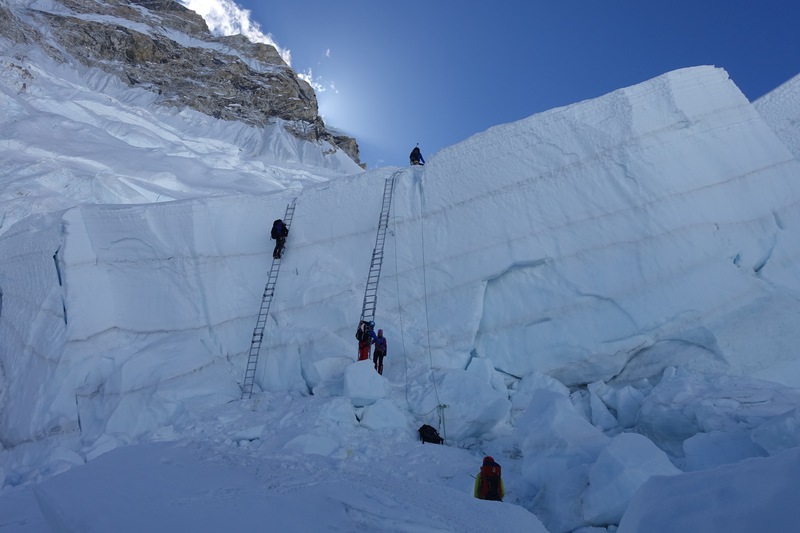 This would give us a good acclimatization drill and would let us see the route above the icefall. Very exciting stuff. We started in predawn cold, as usual. A quick breakfast and we were on our way. Stopping at the puja altar, we were disheartened to see that the supply of juniper boughs was exhausted. Phinjo was not pleased, and the other Sherpa were eager to rectify the situation, but no juniper was to be found, and after a short time we settled on tossing rice onto the altar while they chanted a ceremonial song, which was apparently respectful enough of the mountain to permit us to proceed. It’s funny: I am not a religious or superstitious person (ask anybody), but this did trigger a small feeling of unease in the back of my mind. I tried to ignore it: This is not a bad omen. This rotation will be easy. No one will get hurt. 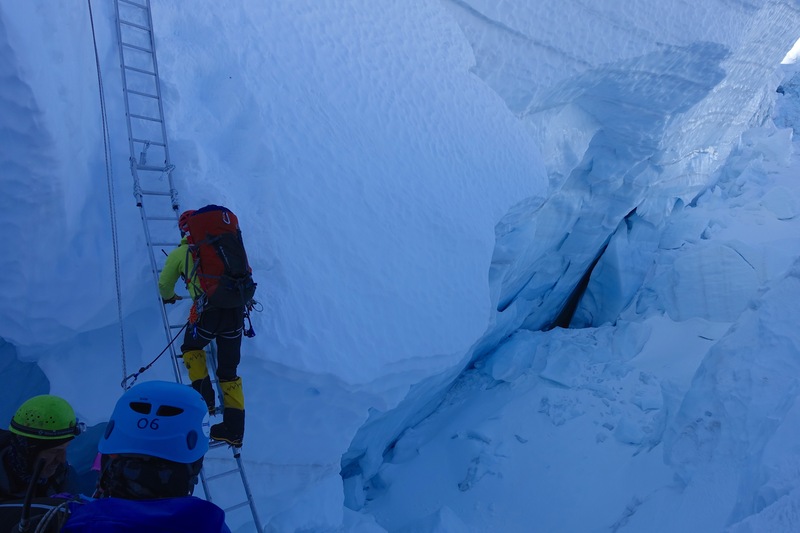 By the time we got the spikes on at crampon point, I was busy enough that I could focus on the moment and do my job, and this episode faded from my mind, replaced by the pain of getting up the icefall. 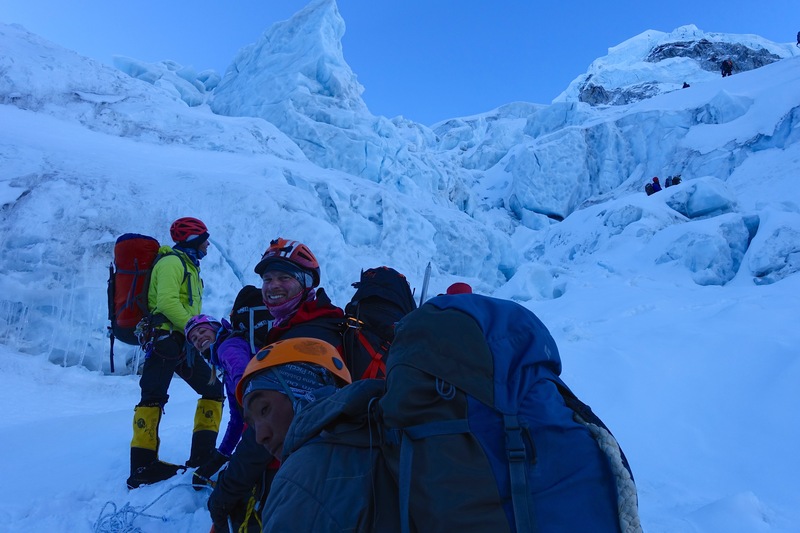 Sunshine hits the top of Pumori behind us as we start up the steep part of the Khumbu Icefall. 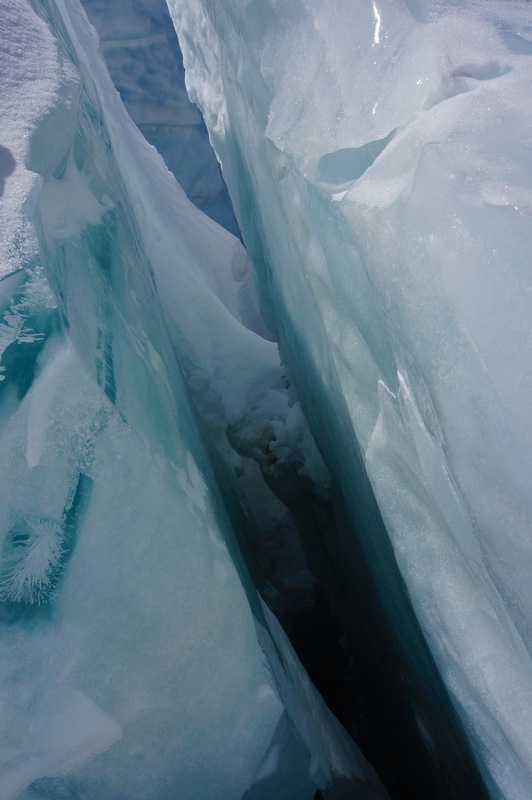 The lower sections are flat enough that pools of water accumulate between small ice pinnacles. 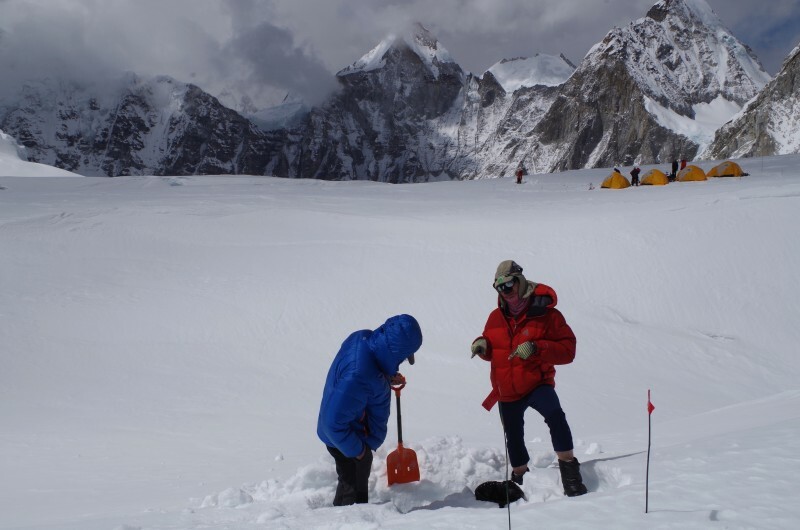 These glacial tarns are coated with a thick layer of bulletproof ice, and we were usually able to cross them with impunity, our crampons biting reassuringly into the surface and giving us great purchase. The previous night, as I tried to get to sleep, I thought about these frozen pools: How strong is the surface ice? What would happen if one of us broke through? 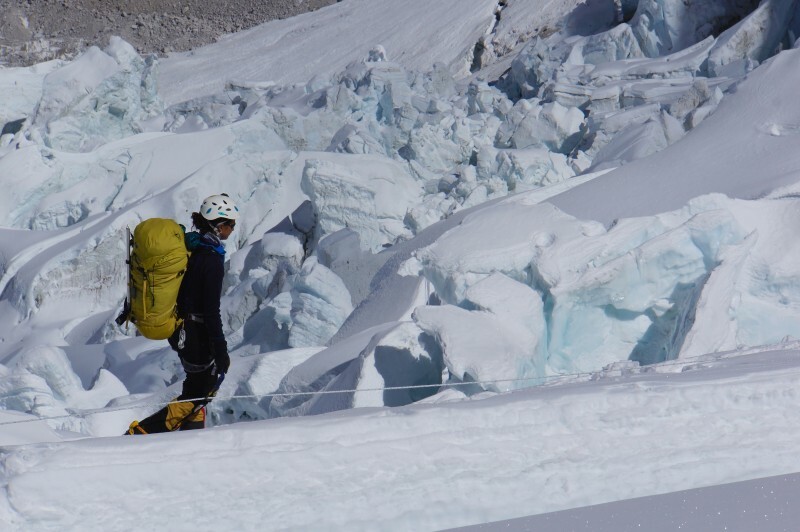 There are other objective hazards to consider in the Khumbu, and I let my thoughts drift to them as I fell asleep. Now, a few hours later in the ice, these frozen pools came into focus again as we crossed them. 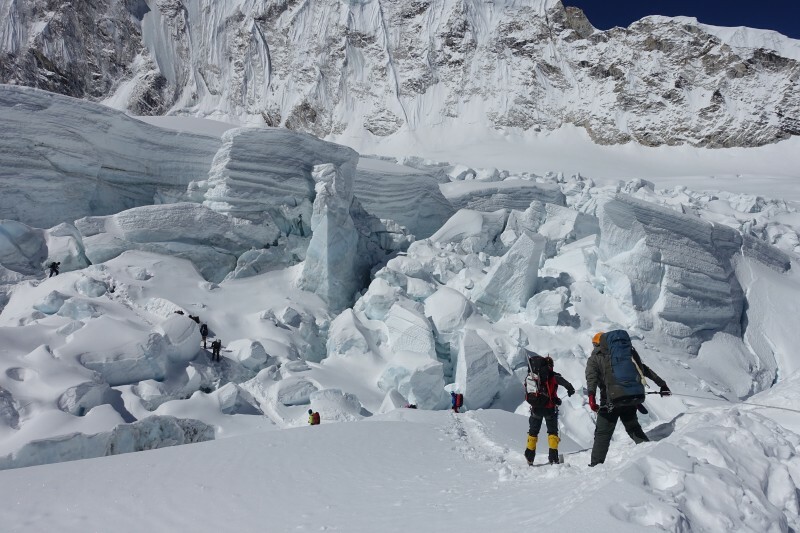 It was so very, very cold that a breakthrough seemed impossible. 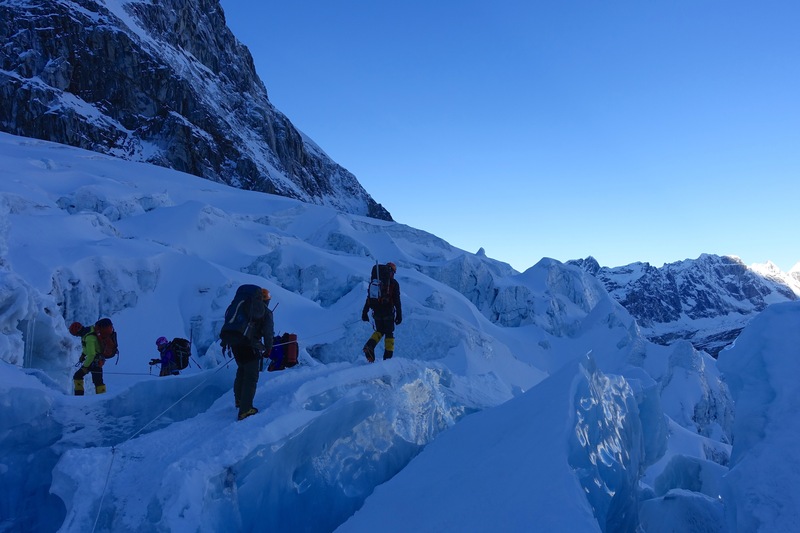 I watched the surface carefully in the blazingly bright white beam of my headlamp: the ice was so pure and clear that it was difficult to see where the crampons stopped and the surface began. No cracking, no creaking, no sign of weakness. Still, I was sure to stick to the edges in case the crust began to crack. Of course, the edge tends to melt first, and the center should be more reliable, but that’s how I was thinking at the time. 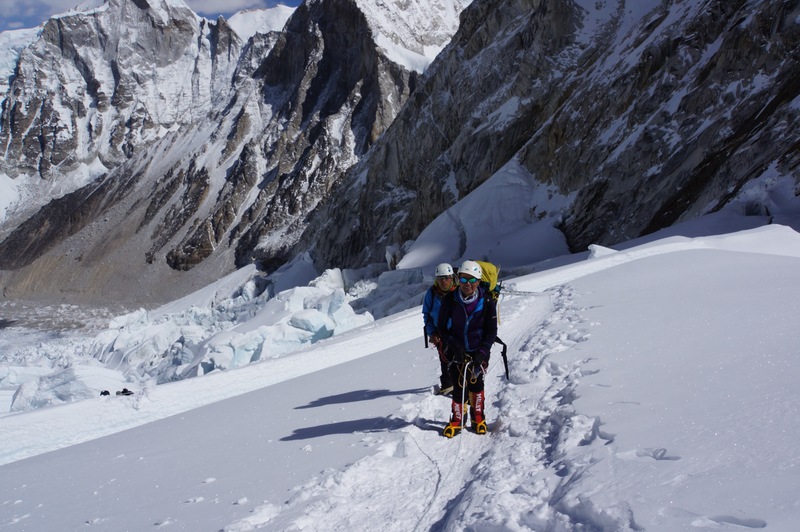 Eventually, after what felt like an hour–but in reality took perhaps 20 minutes–we emerged from the moraine onto the steeper snow slopes of the icefall proper, and I ticked off a task from the to-do list. Those pools are behind us, let’s get to the football field. 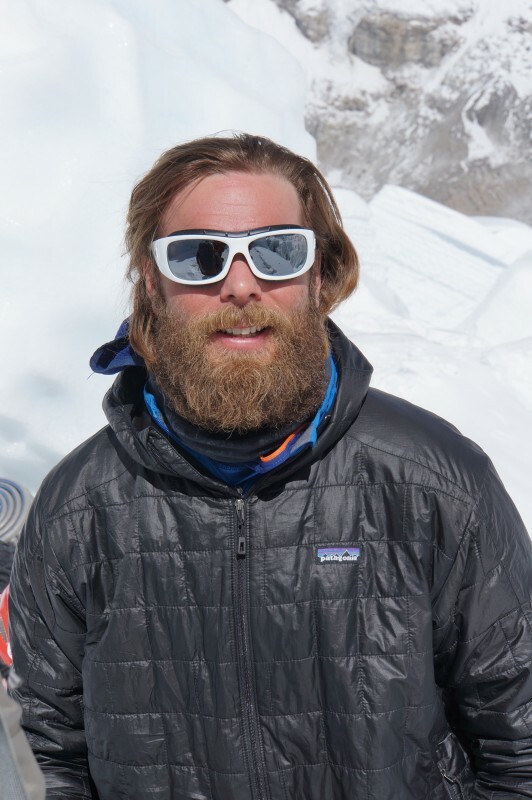 Not a minute later came a concerning call over the radio: One of my teammates had broken through the ice and plunged a leg into the frigid water, all the way in to the knee. His boot was filled with ice water. 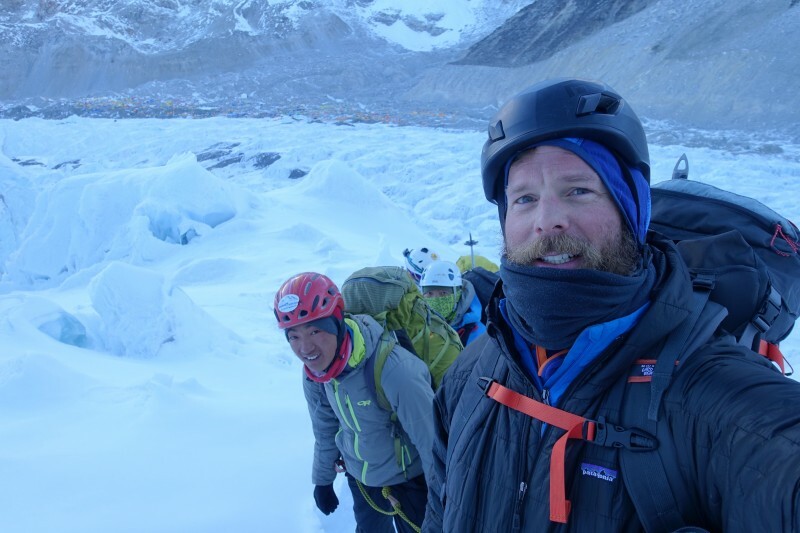 Two guides and his Sherpa were right there with him immediately, helping him cope by changing socks, manually rewarming the foot, and getting a vapor barrier on. But, in the end, they made the best decision: He would turn back to EBC with Phinjo and catch up the following day. I was so disappointed to hear this. 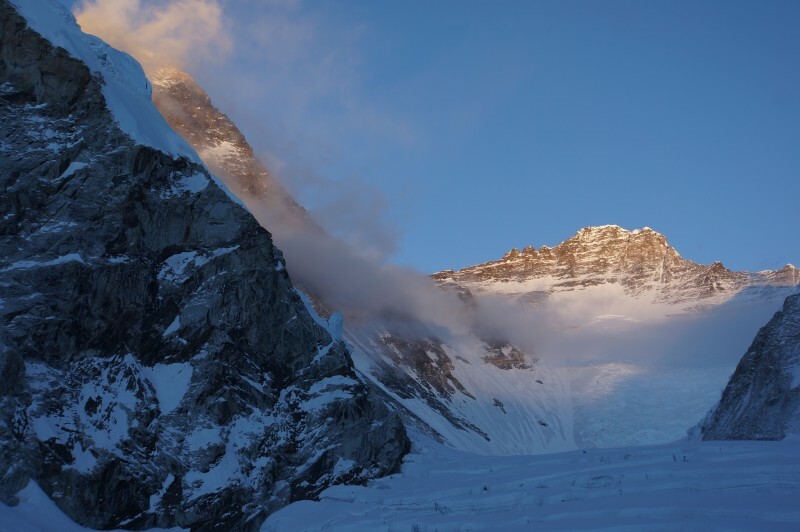 The sky was dawning clear and mostly windless, except for the usual morning katabatic breeze, and I knew that in a couple hours we would be sweltering at C1, which would make it easy to dry out that boot and sock. 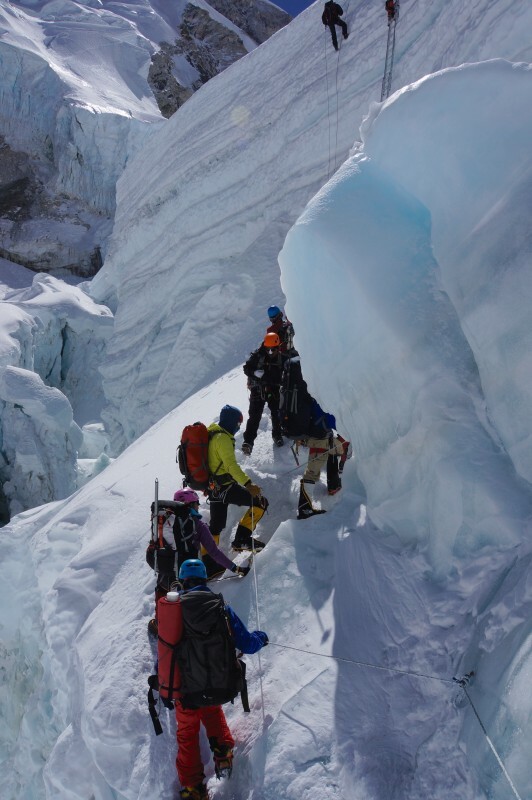 But, the guides were right: It would be crazy cold on the way up, and there was no good reason to take such a risk. 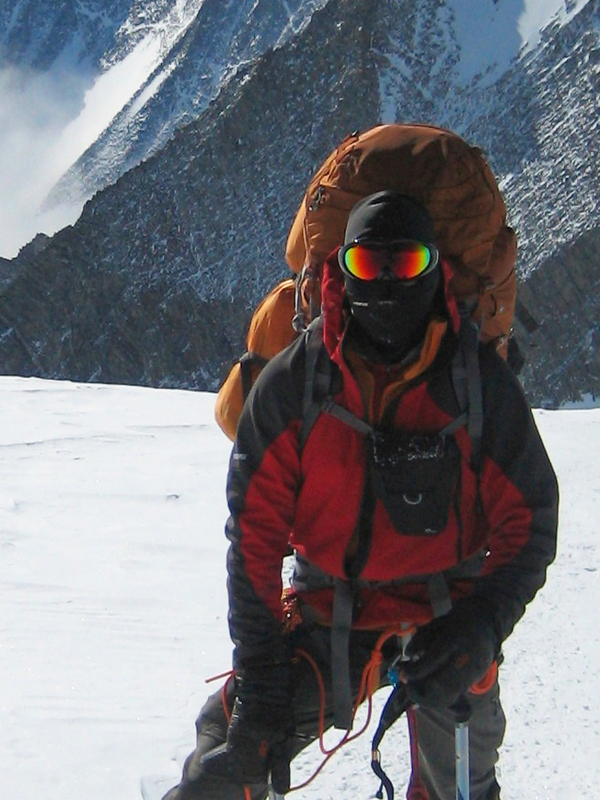 Frostbite is just unacceptable in modern mountaineering. Another teammate was already staying behind by a day because I had prescribed antibiotics for bronchitis the previous day, and it felt rotten to go up without him. And, now, this. We are a tight team, very close and supportive of each other, and moving without someone seemed wrong. I could only imagine how discouraged he felt. And I thought, Maybe that juniper would have been a good idea. But, up we went. Less painful than the last time, with slightly easier breathing and more certain footing. The route was familiar, and less intimidating. Features that looked vertical were not really that bad, and knowing this allowed me to relax a bit. Our buddies from an IMG Classic team had left an hour ahead of us, on their first foray to the football field, and it was great to see them on the lines, looking strong and having a ball. 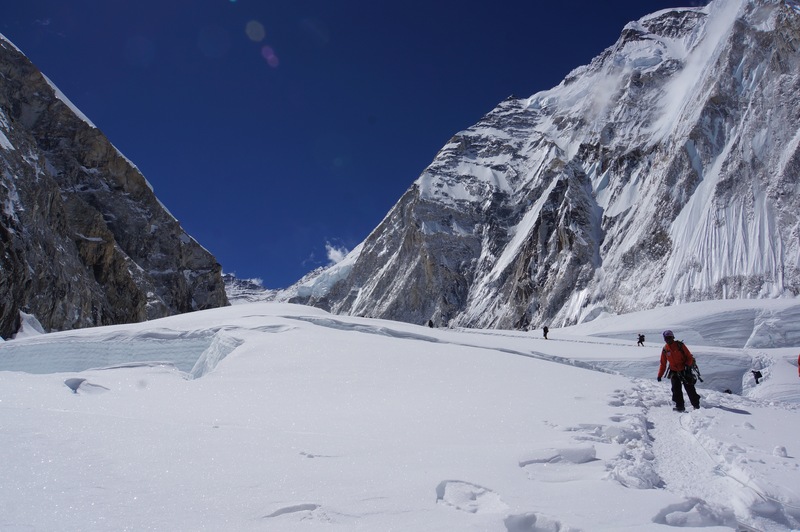 When I reached the short shattered section, where the lines were buried under fallen seracs, it was nice to see Luke, one of the IMG guides, standing there, shaking his head, and saying out loud what I was feeling: “I don’t like it here.” We seemed to make it up to the football field in less time that before. 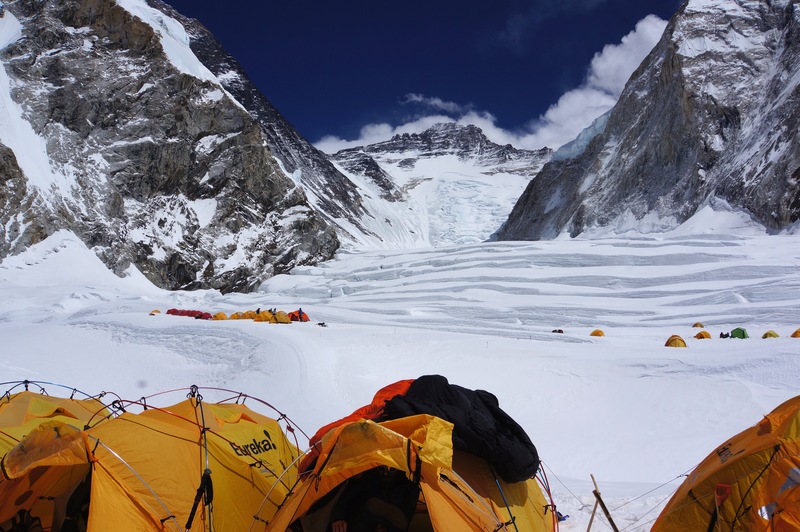 Still, a very tough hump, and I was glad for a short break before saddling up and seeing the new territory of the upper icefall. 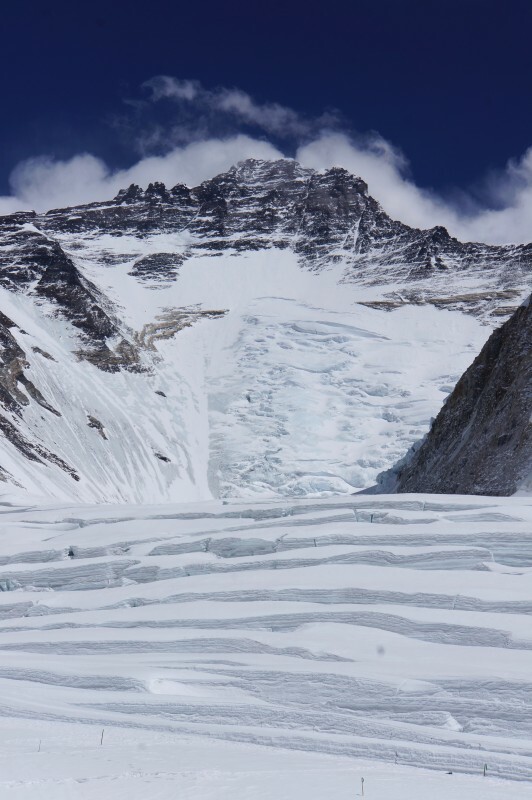 From crampon point, the football field appears to be at the top of the icefall, but this is an illusion because the terrain moderates in steepness, and the glacier above is hidden from view. So, this region was previously unseen, although it loomed larger than life in my imagination. I knew there were a series of ladders up there, including a 5-ladder vertical section. 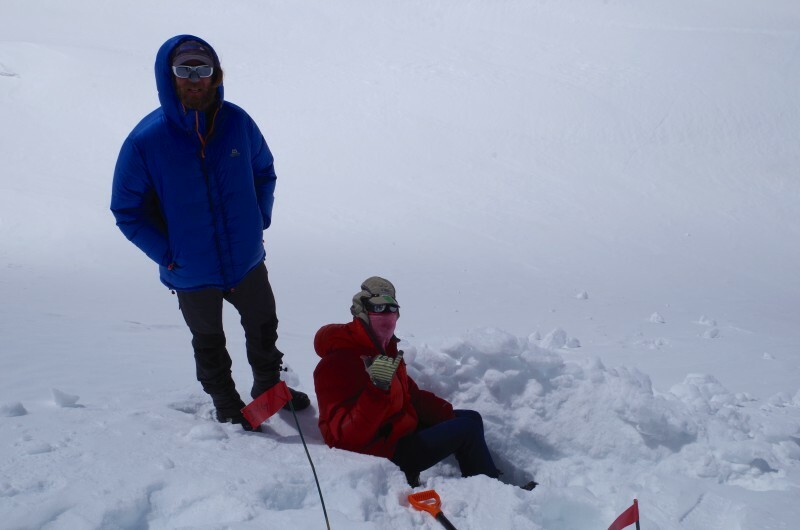 “Make sure you clip your ascender,” one of our guides had said the previous day. And I remember thinking, Yes. Yes I will. It was a long, exhausting morning. More traffic than the last time meant that we had to wait at the vertical ladders (three in all that I remember). 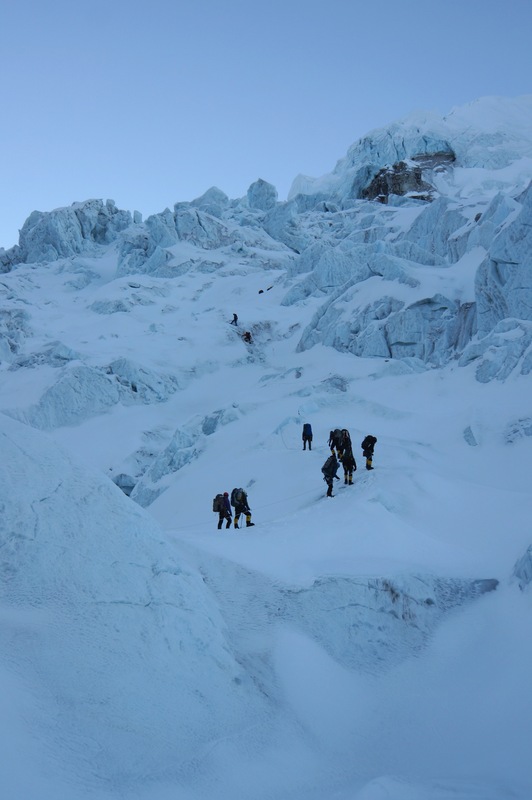 There were times when there was simply nothing to do but stand in line and wait for the climbers ahead of us. On one hand, this enforced moments of rest, and I needed them; I found my breathing rate fell to normal after about 90 seconds of standing still, from full-on panting to baseline deep, rhythmic pressure breathing. 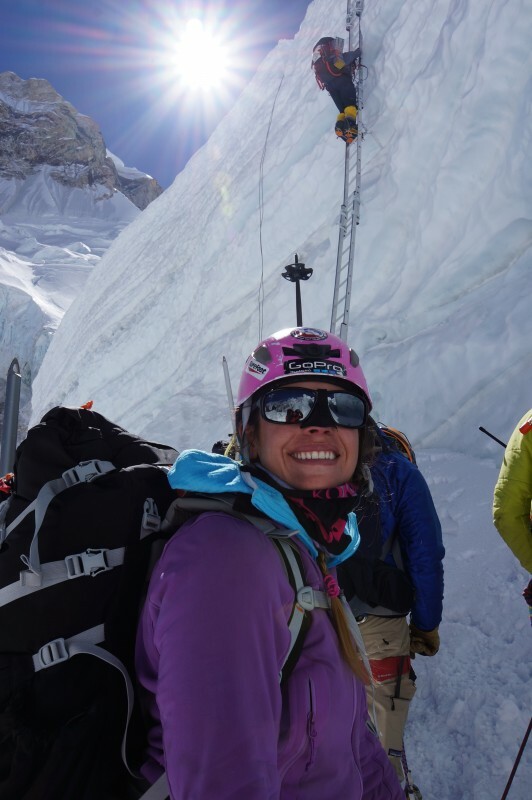 During these times I tried to keep busy by adjusting my gear, reapplying sunscreen, shooting photos, learning the route above and practicing the ascent in my mind. But, even standing still for 5 minutes took a toll on my mindset. The fragility of our circumstance threatened to weigh on me. Let’s go, let’s go, get the lead out! The sun blazed down on the route, which was another source of anxiety. 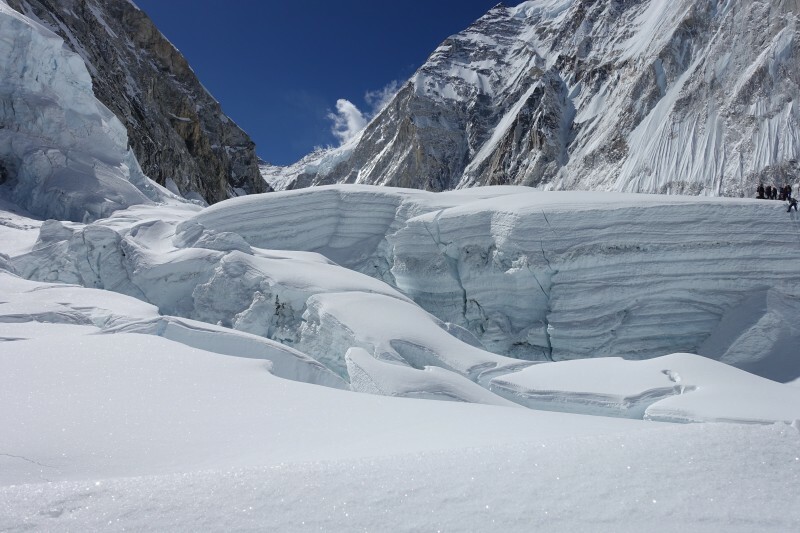 Unlike traditional snowfields, I believe that this terrain is NOT under more threat of avalanche activity during the day versus at night; the seracs are just too darn huge to be affected by the short-term effects of the heat. But, after years of learning to fear what happens in soft snow, I could not avoid feeling a bit anxious about the time of day. In fact, the route was totally solid and there were no sloughs whatsoever. 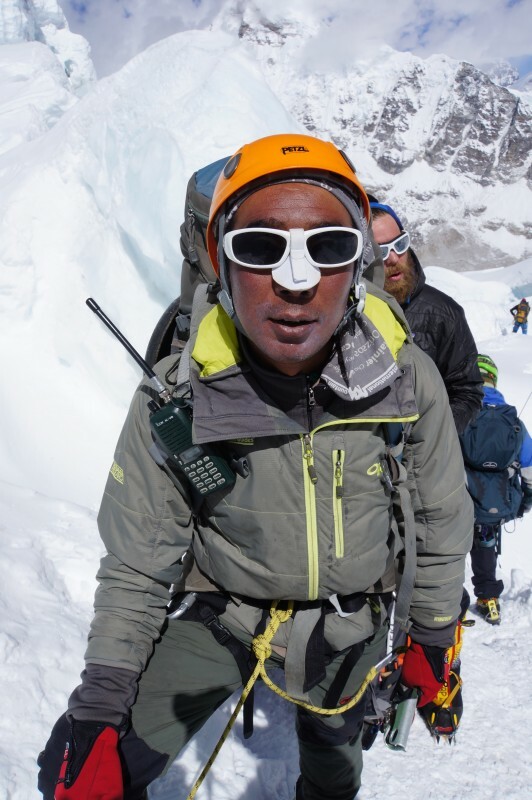 Pumori in full sunshine. 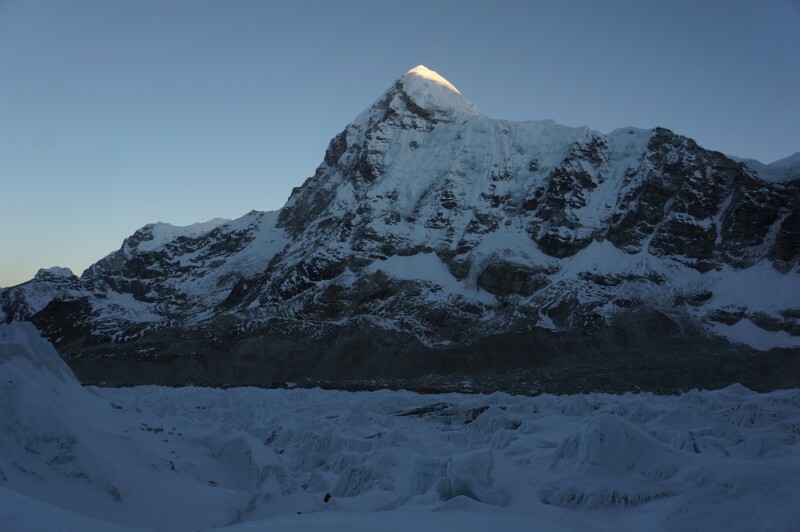 The shadow of Everest is creeping out of our path, and we are about to be enveloped in sunshine. The view from the bottom of the quad ladder, looking at Nuptse. Andy scales the parallel quad ladder in a flash. 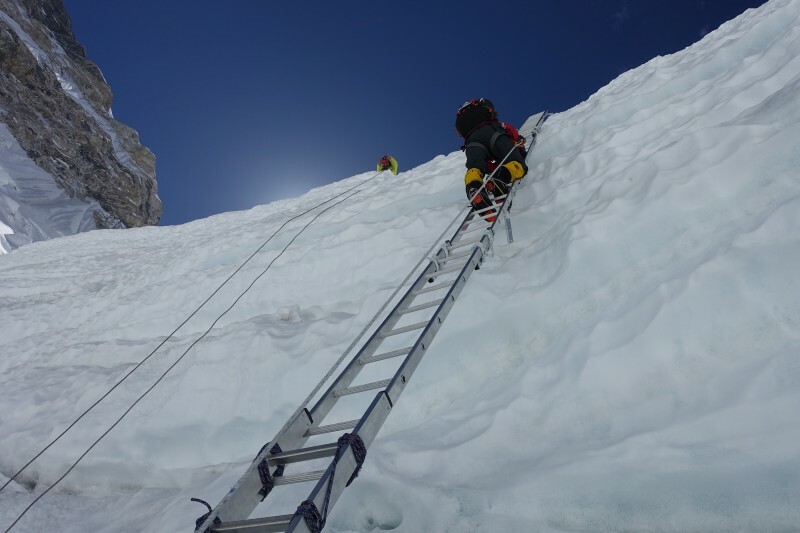 Kim nears the top of the quad ladder. 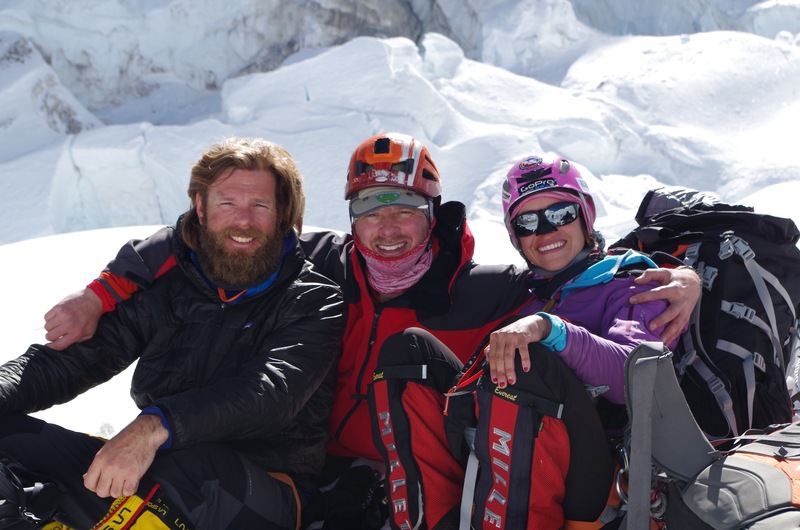 Kim, Pasang Kami, and Andy at a break above the quad ladder. Blake tops out on the quad, in fine form. EBC seen far below in telephoto. 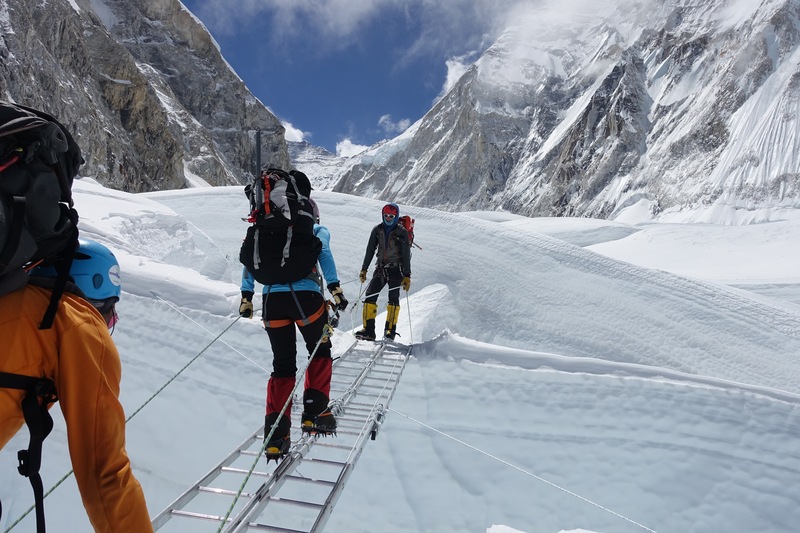 The route below the quad ladder, and EBC beyond. The route got crowded that day. 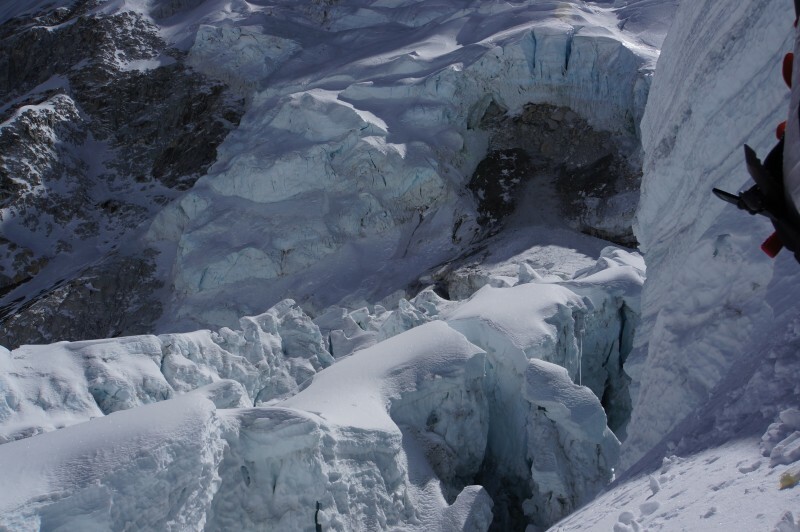 Raw, ragged edge of the hanging glacier that fell and tragically took many Sherpa lives the year before. Seen in telephoto, it was well away from our route this year. 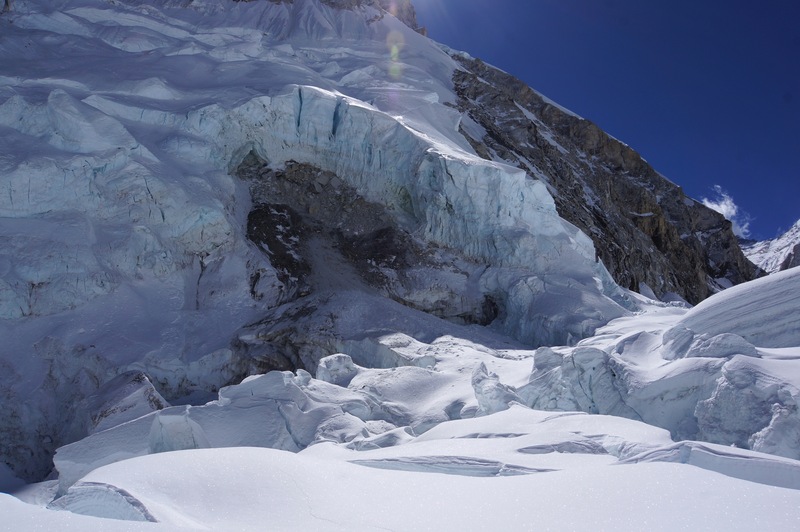 The Horseshoe Glacier, just up valley from the tragic section. Again, well to our left as we climb this year. 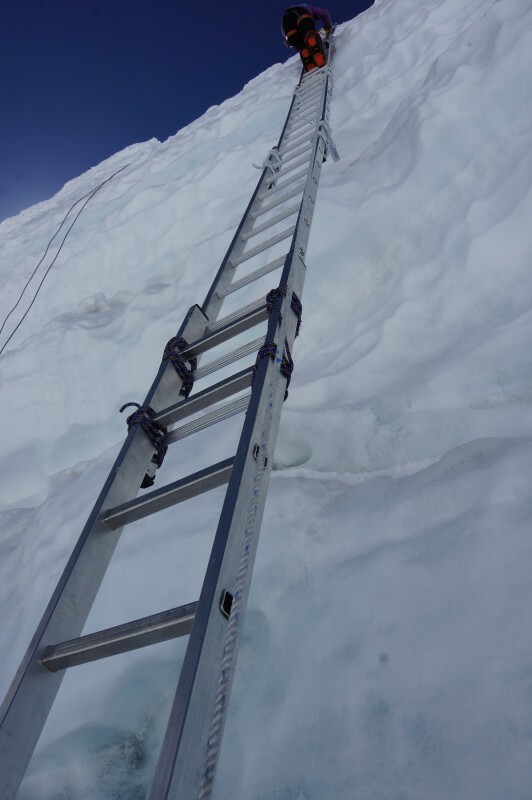 Tradeoff: All those tall, vertical sections that need ladders for ascent. Fatima traverses after topping out on the quad. 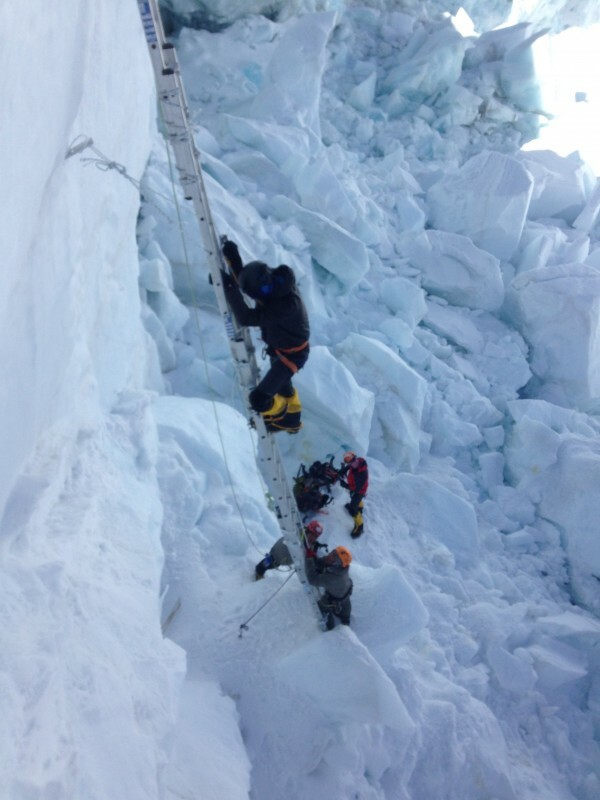 Here comes Fatima after crossing a short horizontal ladder. 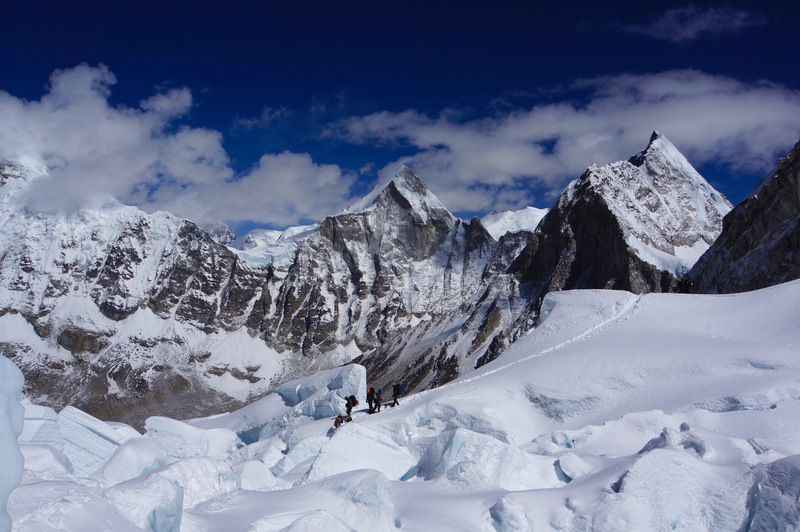 We can start to see the great western cwm above… Lhotse’s summit almost in view here. 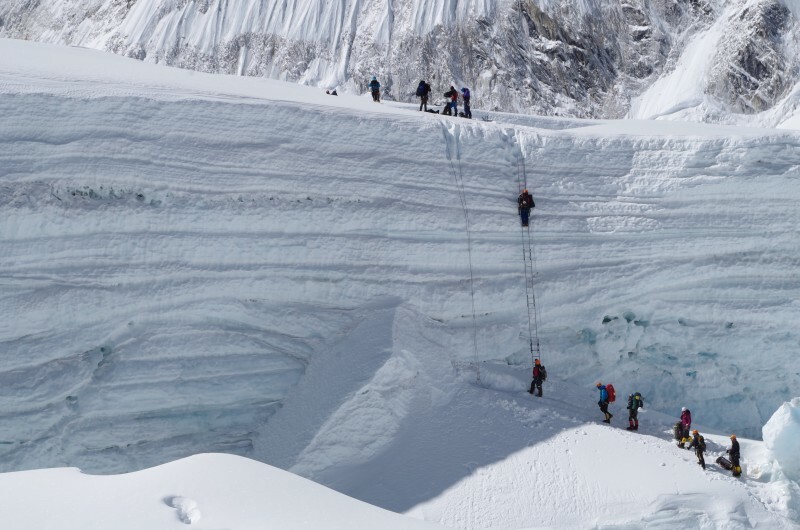 The hanging ice on Nuptse is impressive. 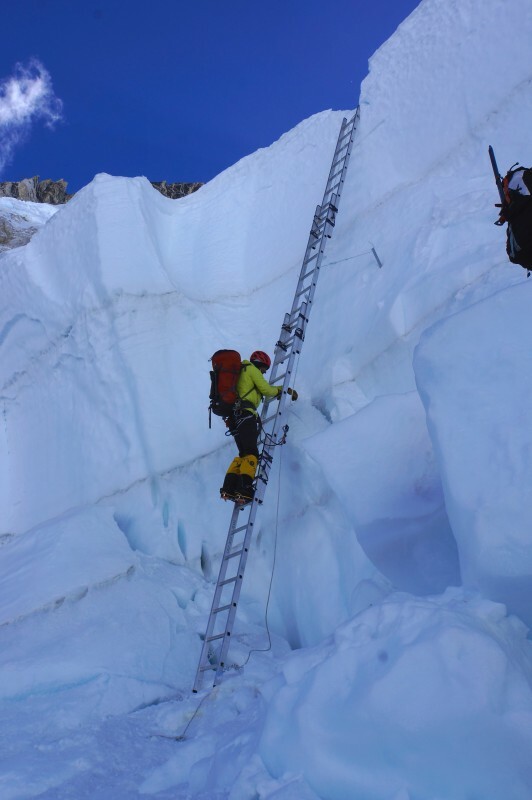 The 5-ladder section, with rappel line to its left. 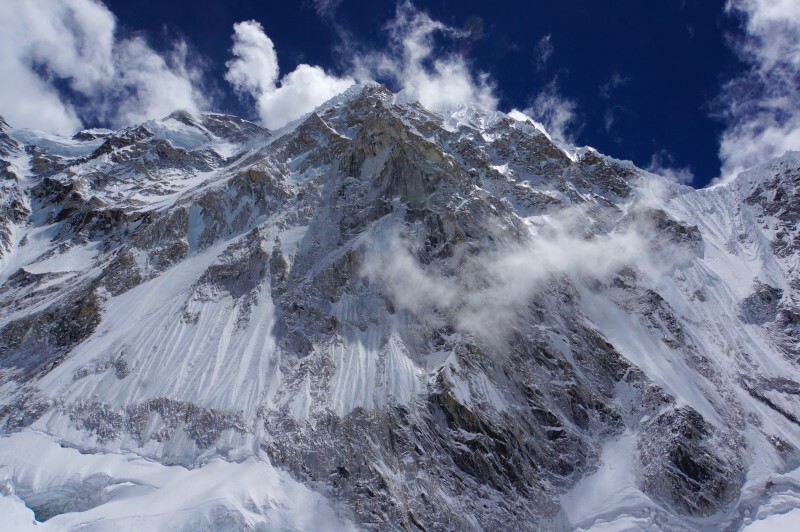 Nuptse watches above. 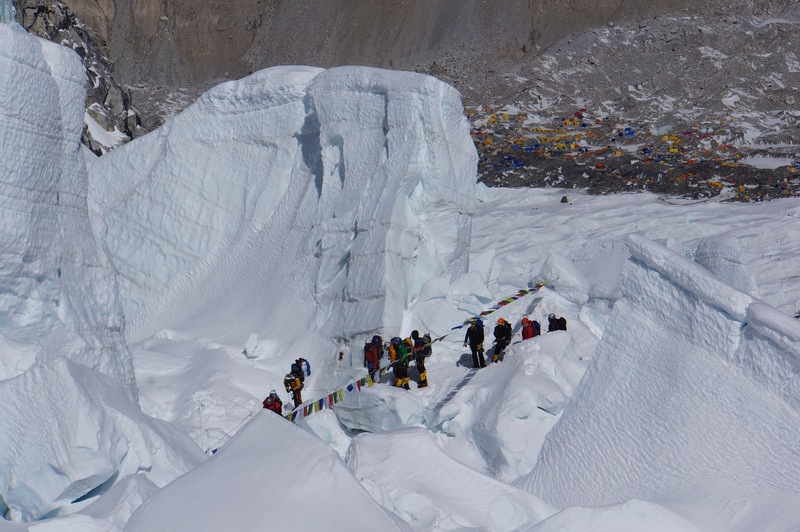 After a break, we prepare to drop down into a jumble of popcorn seracs below the 5-ladder-section on the left. More and more climbers arrive on our tails. Some of the ice seems ancient, made from layers of snow squeezed solid by years and years of weight above. Bulletproof, blue, and eerie. The vertical sections were short but exhausting. 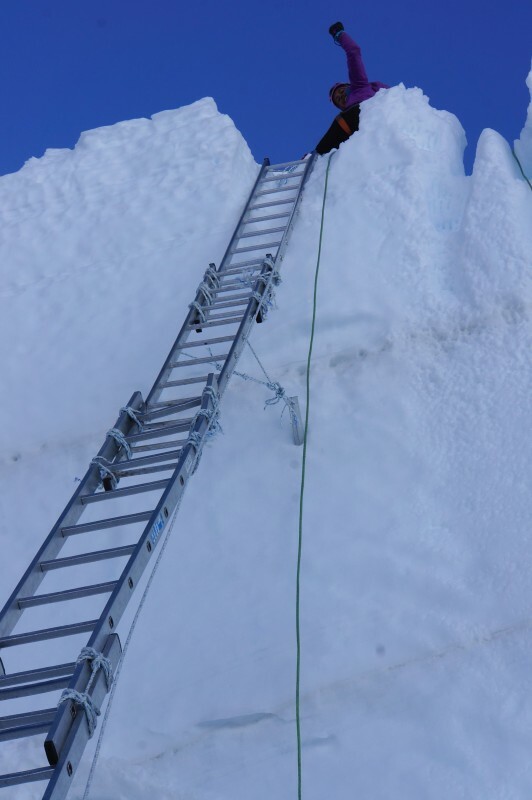 One of them, five ladders tall (about 50 feet), stood alone with a rappel rope beside it. 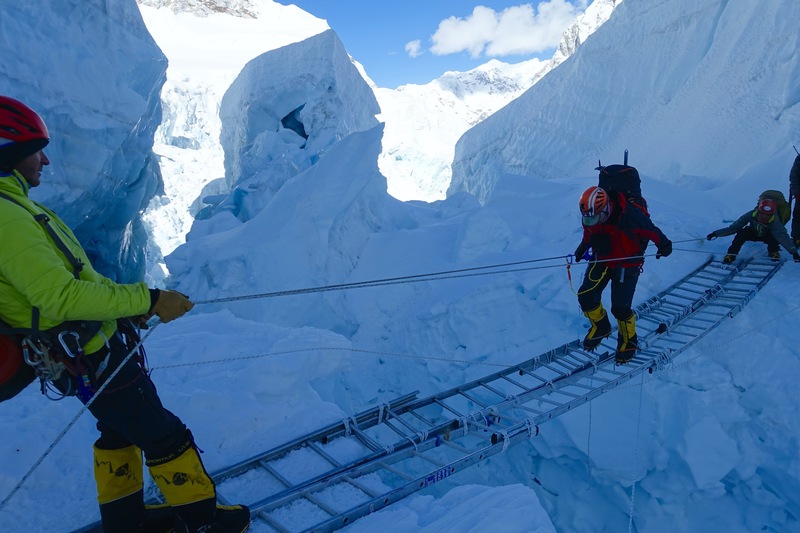 The Sherpa offered to haul my pack up by rope while I climbed the ladder. Like a fool, I declined. 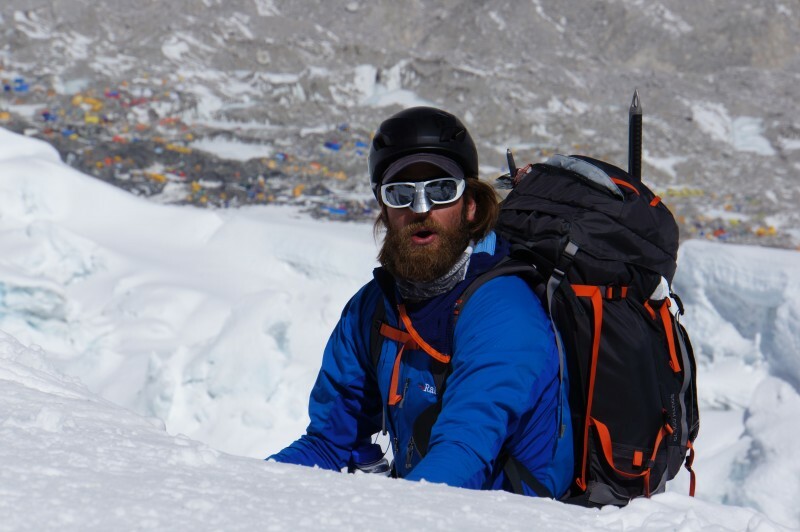 I’m climbing Everest, damn it, and I can carry my own pack. In fact, I was so irked by the slow pace of progress above me that I resolved to get up that ladder in a flash. About halfway up, I wondered why the hell I had done that. The effort was extreme. 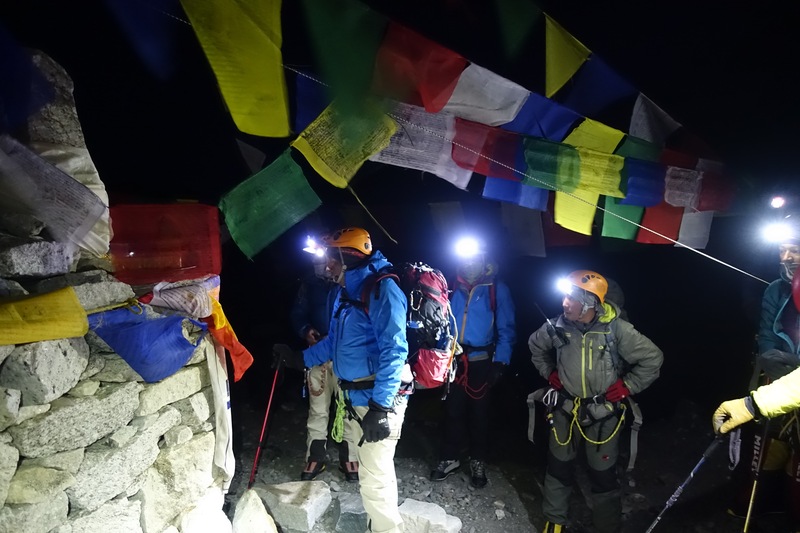 My breathing accelerated out of control, and I began to feel the telltale signs of an impending syncope (ringing in the ears, scintillations at the margin of my vision). 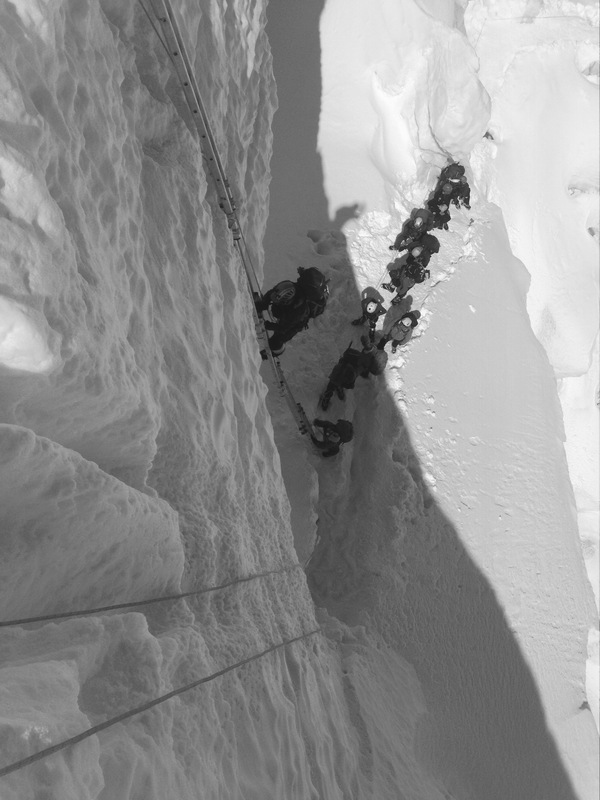 I made sure that my ascender was pulled tight above me on the safety line, stopped climbing, and prepared to pass out. I focused on slowing my breathing down, trying desperately to recapture some CO2 while I held on as tightly as I could. This worked, and after what felt like a minute, but was probably about 10 seconds, I was fine. Slow the f down. This is not a race. 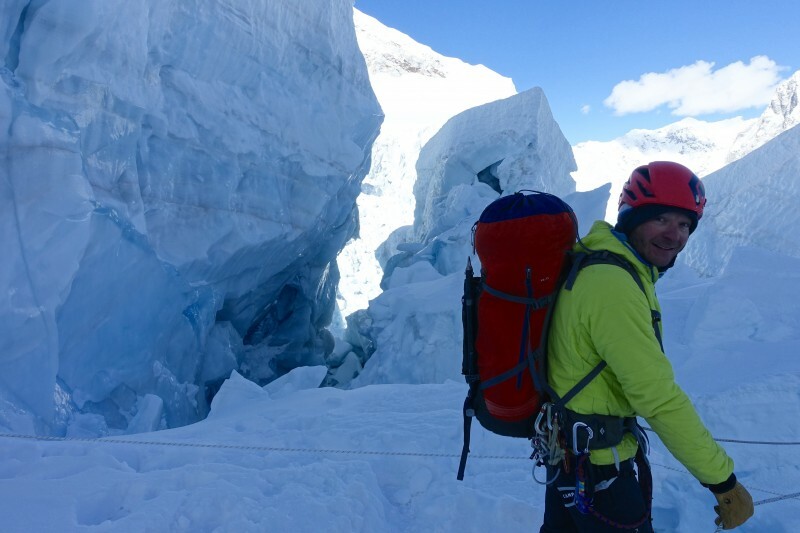 I topped out a few moments later, and sat on the snow beside my buddies, catching my breath, and taking in the incredible view of the icefall below and the cwm above. 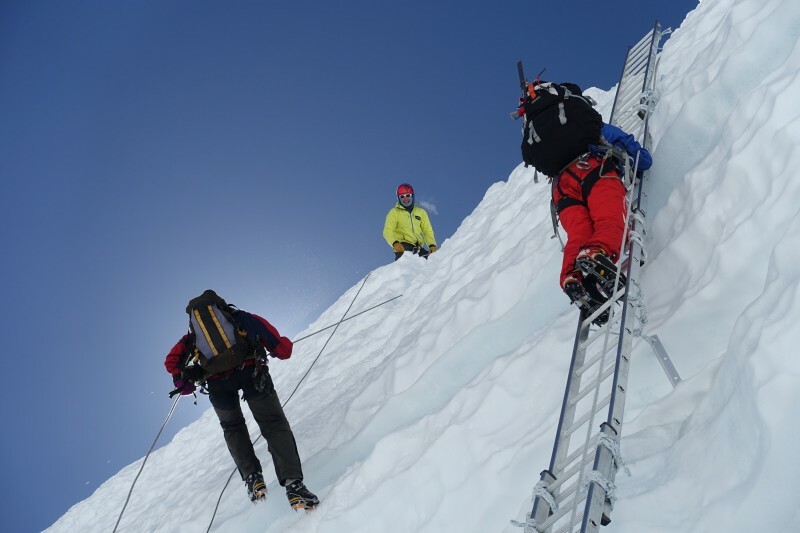 A climber from another team was descending, and asked us how to to get down. 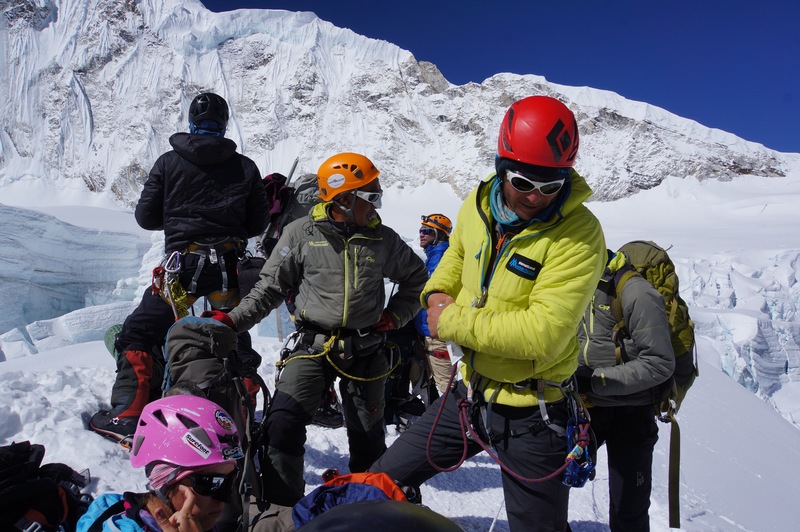 We literally showed him the ropes, and I thought, Where is this guy’s Sherpa? The rest of his team? Didn’t he come up this way? 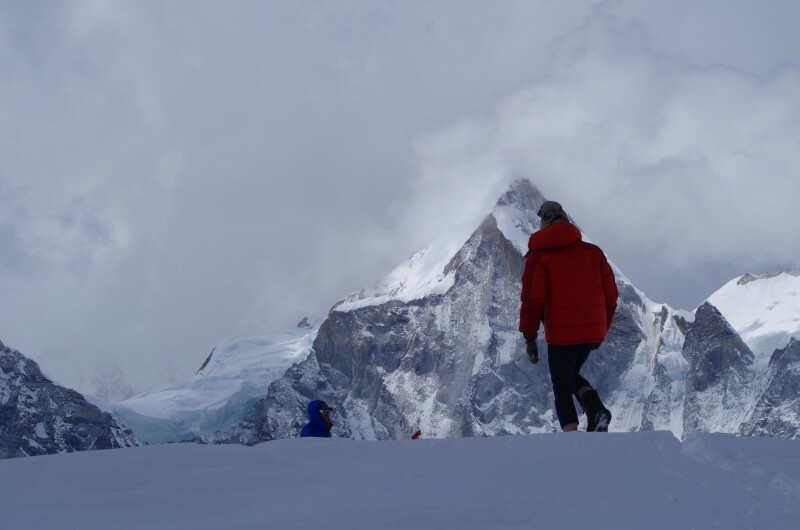 We watched him struggle with his ATC, and I mentally thanked my guides for insisting that we carry figure-8 devices instead; they were exactly right, the ATC is tough to handle with thick gloves, with a frozen rope, at extreme altitude. Anyhow, that guy made it down fine. 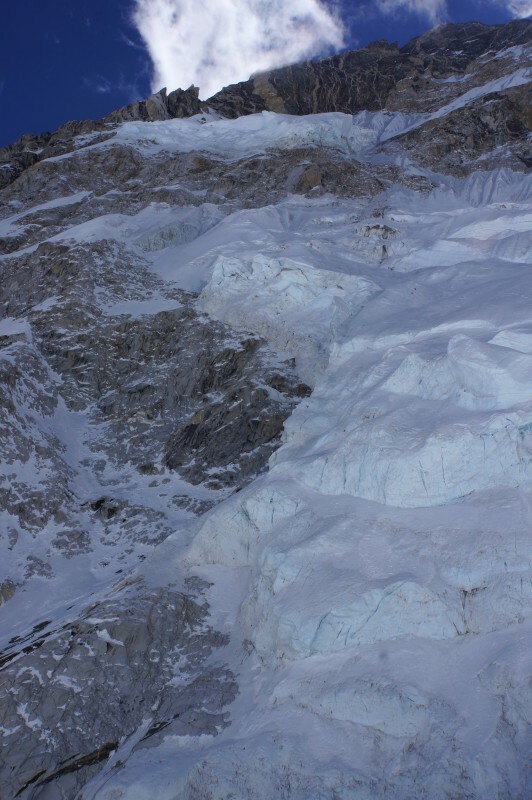 The tragic ice (upper left) and horseshoe glacier seen from the base of the 5-ladder. Again, we are well away from any collapse hazard here. 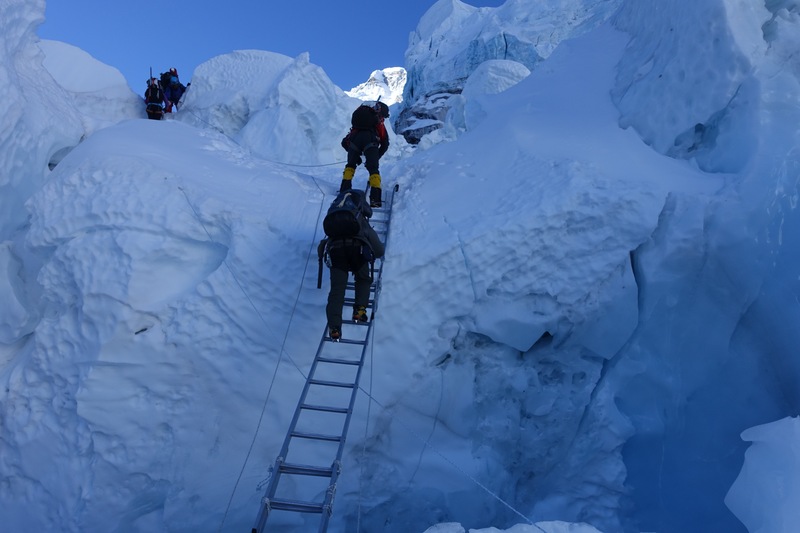 Andy and Kim ascend to the bottom of the 5-ladder. Blake chills while awaiting his turn. Pasang Kami queuing for the 5-ladder. Nothing slows Kim down… except traffic. Kim tops out on the 5. 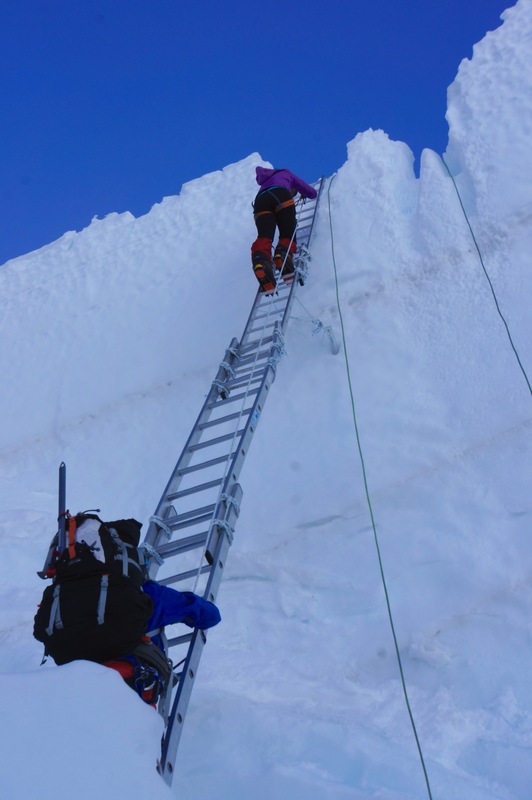 Above the last ladder lay the cruelest illusion: I imagined that C1 was just a few minutes farther, just over the next rise, but in fact we climbed for at least an hour, negotiating a serpentine path between massive crevasses. Cloud cover emerged, flattening the light, and turning the land into a stultifying, windless greenhouse. Up, down, and around huge, huge seracs and snow features, many of which looked like giant hunks of baked Alaska, twenty layers thick, threatening to topple over (or so it seemed). The seemingly endless, serpentine route to C1. 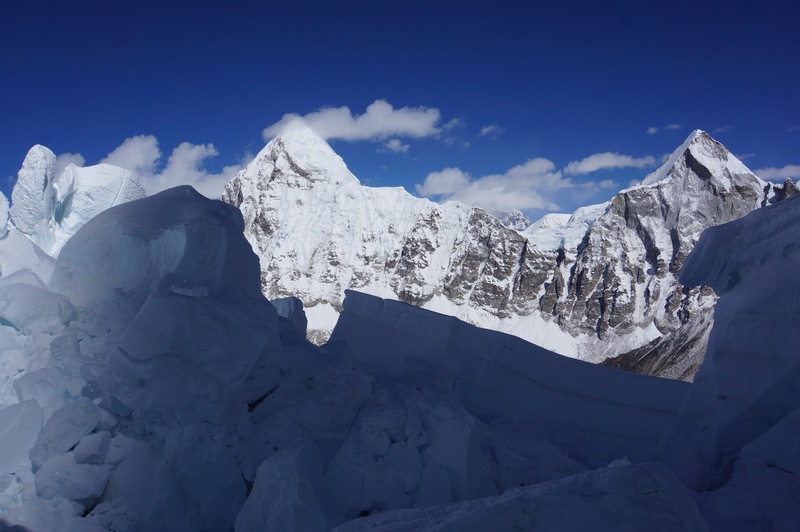 Lhotse peeking out in the distance. Some seracs remind me of chess pieces. Big, deadly chess pieces. 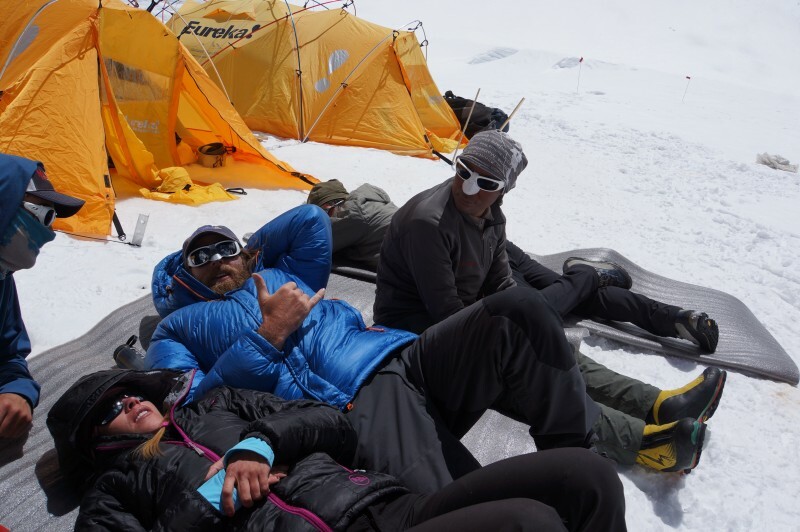 Somehow I got separated from Blake and Kim in front of me, when climbers from a different expedition got between us. 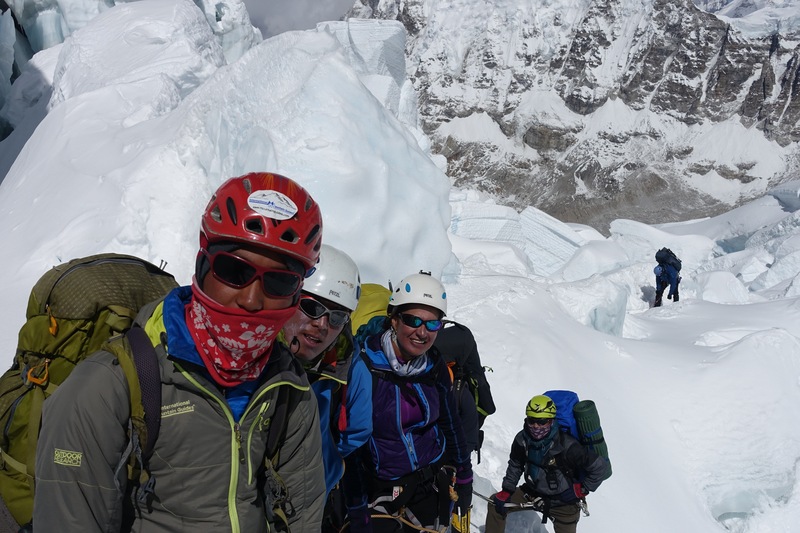 This is totally fine, nothing more than mentally aggravating, simply because I want to climb with my people… and because one member of this other team was climbing very slowly. At one point his guide who was in tow turned around and smiled a sheepish smile as if to apologize. “Don’t worry about it, I am liking the slow pace.” And, I was. But, it was a bummer to pull into C1 after my friends. C1 sits on a series of broad, gently rolling glacier features. The clouds burned off and we saw the route in blazing sunshine. 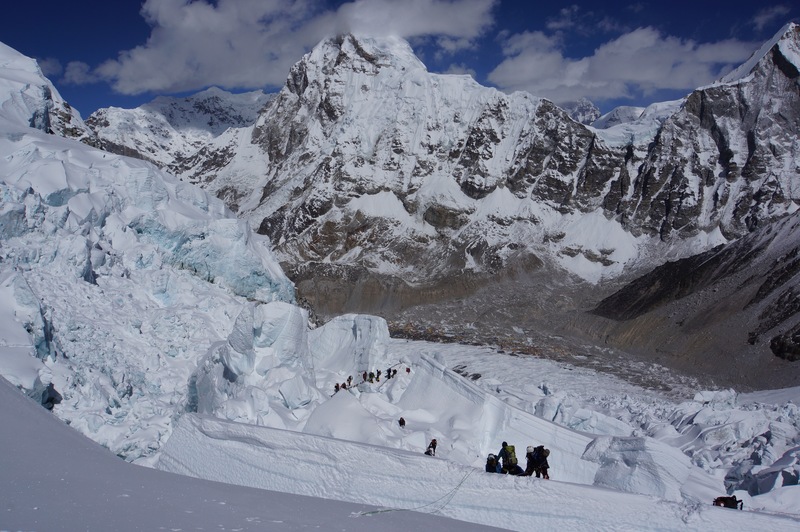 Below, the chaos of the icefall and the sharp peak of Pumori beyond. 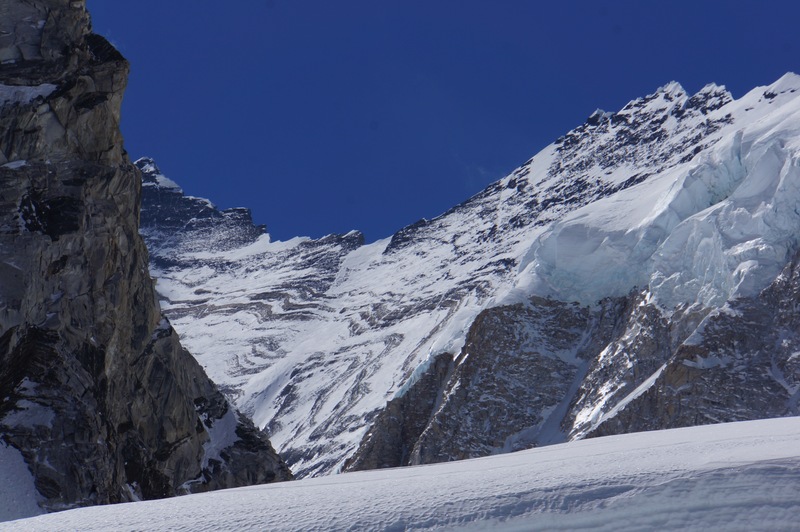 Above, the great western cwm, a deep valley formed by the Western Shoulder on one side, Nuptse on the other, and the summit of Lhotse at the far end. 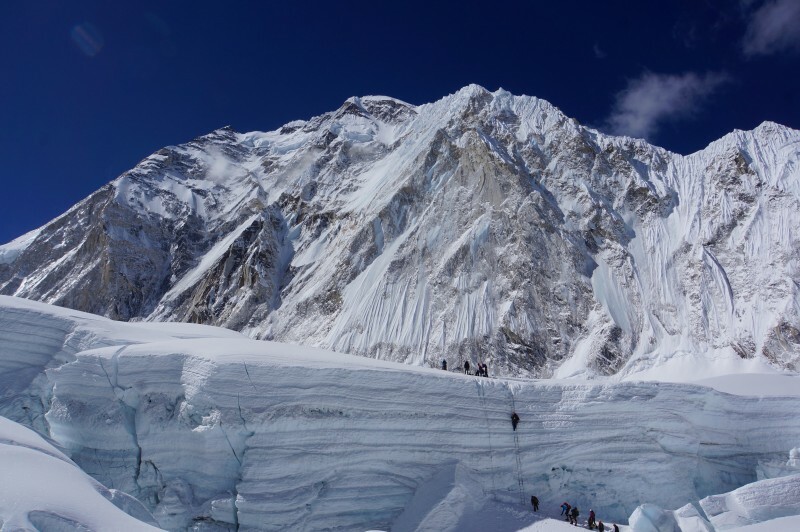 The summit of Everest looked totally bare of snow, clean striations of dark stone against the pure blue sky, and the yellow band as clear as day. I was exhausted but totally elated. We are at 20,000 feet. 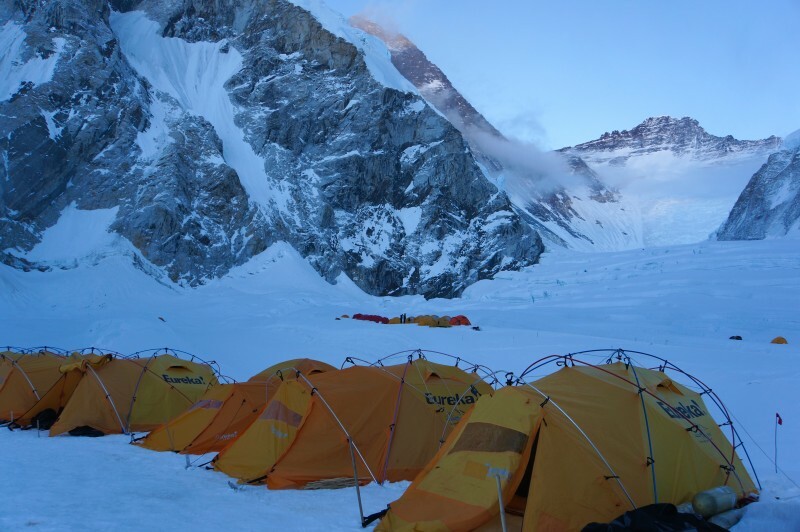 This is Camp 1. I have dreamed of this for a lifetime. And here it is. 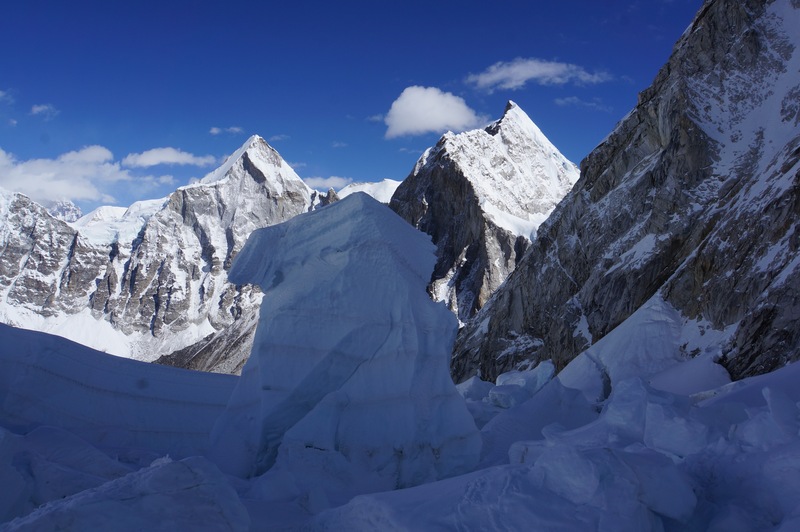 C1, with Everest on the left, Lhotse at center, and Nuptse on the right. 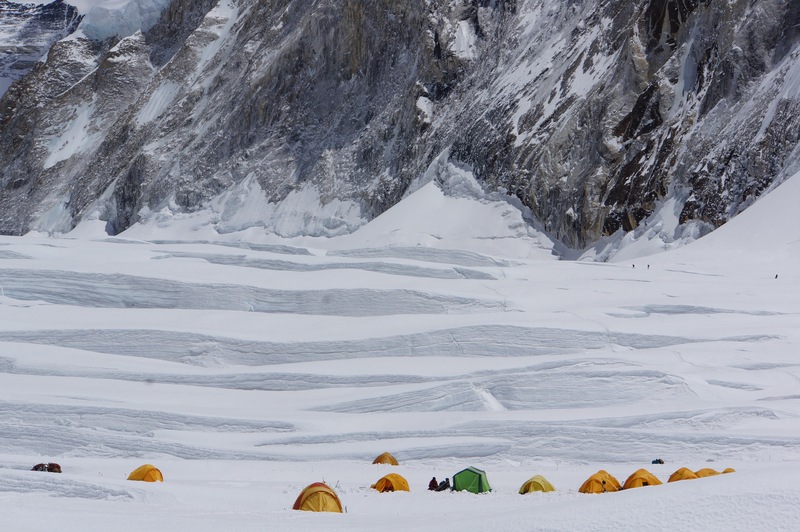 Other teams at C1… note the climbers at top right headed towards C2 (not visible but 1,300 feet higher and about a mile away). 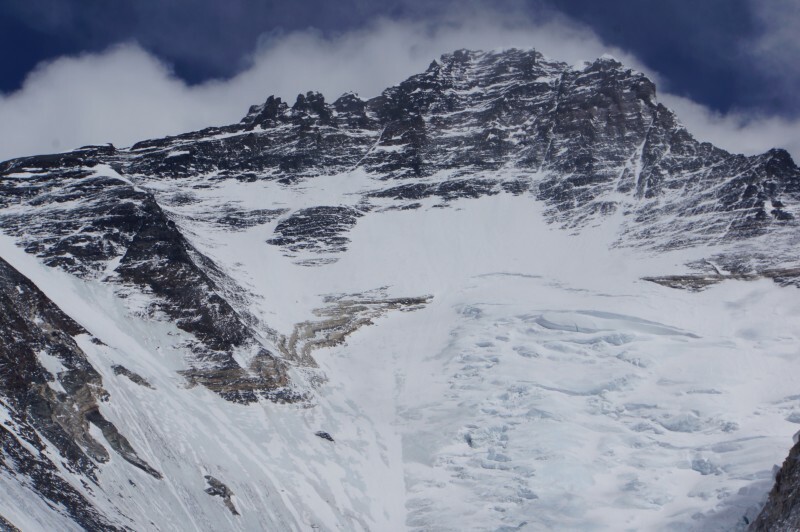 Lhotse, the end of the cwm. 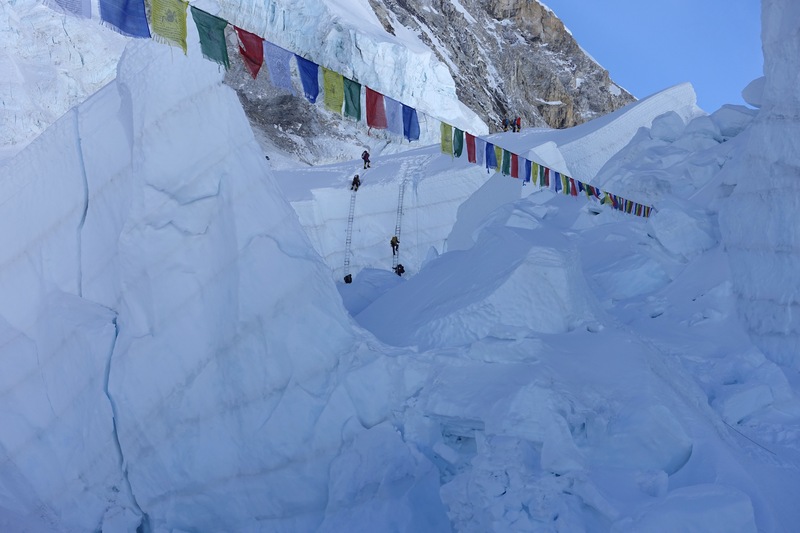 C3 should be built halfway up the Lhotse face… sadly, in the end, this did not happen this year. 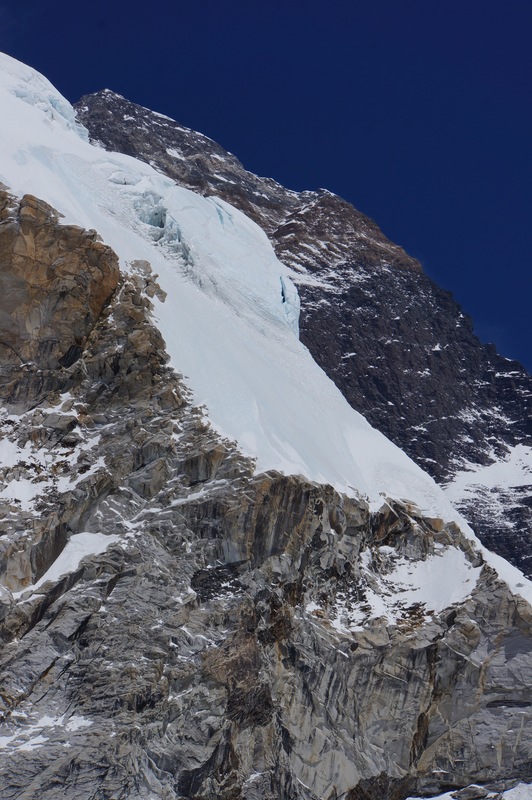 Closeup of Lhotse in telephoto… the layer of Nuptse Leucogranite is easily seen, as is the Geneva Spur on the left. Just left of that, and out of frame, lies the South Col. Summit of Everest hiding behind the west shoulder… the Hillary Step, cornice traverse, and south summit seem pretty bare of snow at the moment. 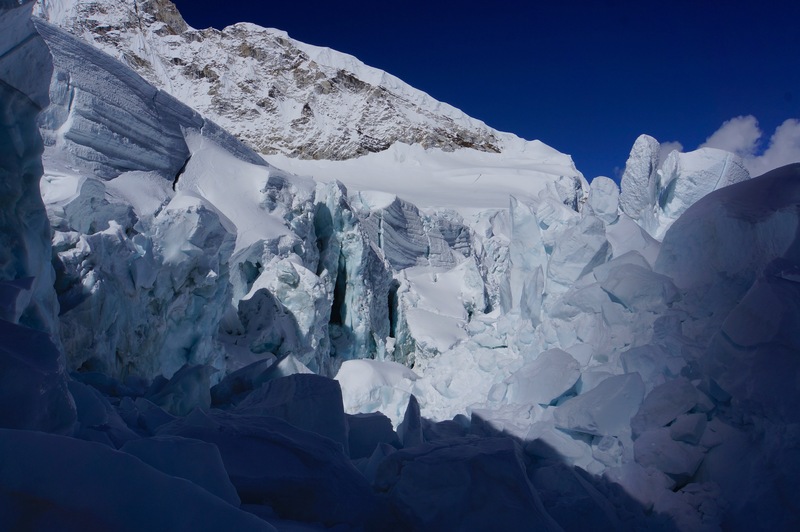 Nuptse watches above C1. 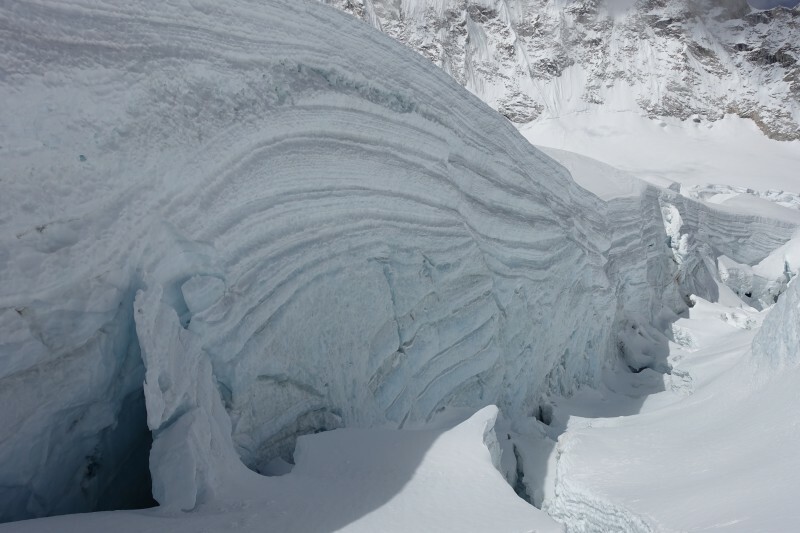 Check those cornices and hanging glaciers! Panorama of the view looking up the cwm from C1. Sunbathing, hydrating, relaxing, laughing, and resting for several hours. In the direct sun it was scorching, though if a cloud drifted overhead the temperature plummeted in a moment. Blake and I took the initiative to dig a latrine, which was exhausting work. Our reward? A sun bath. Sun dogs of a different kind. That evening we got into our down suits and huddled in the cook tent, enjoying our MRE’s. 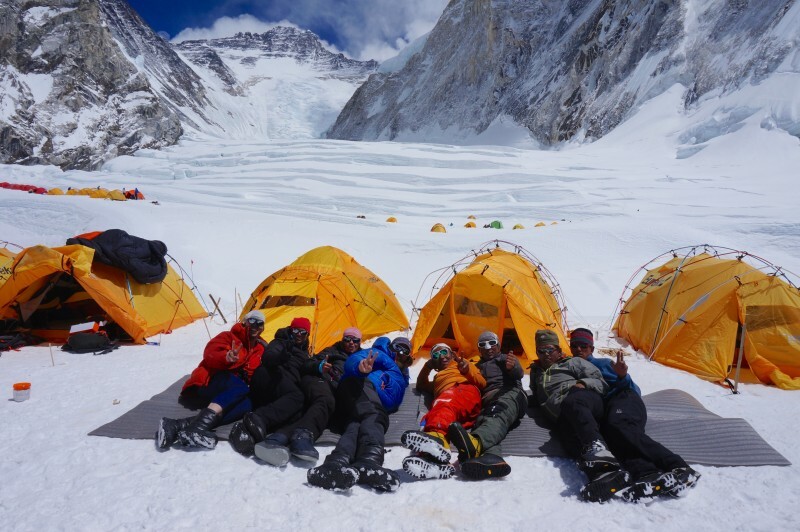 C1 is much less “posh” than EBC or C2… it is a kind of way-point between these more substantial camps, and so our meals were more traditional mountaineering fare, which made me appreciate the wonderful kitchen work of our team at EBC even more. 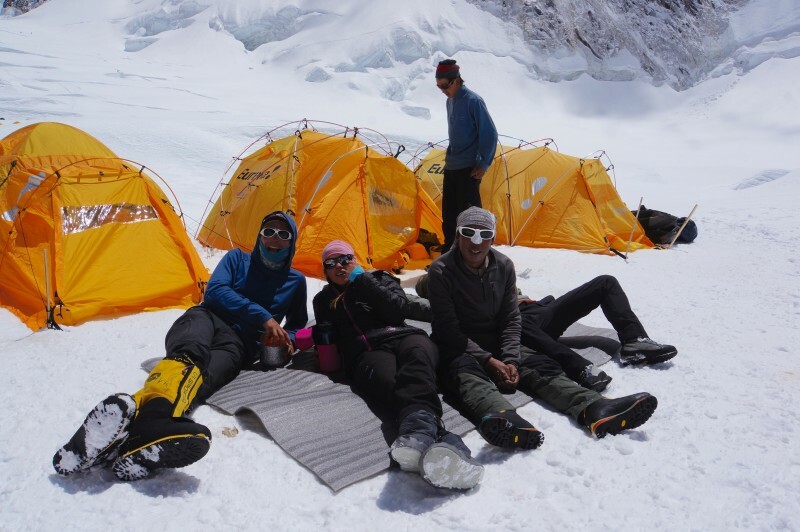 Although conditions were spartan, the Sherpa kindly made us a delicious batch of milk tea, fortified with salt and sugar. It warmed my bones. Then, for the piece de resistance, they broke out a container of stinky cheese and boiled it into a noxious stew. Folks, this is truly an acquired taste! And, they knew it, drawing delight from watching us try to stifle our gag reflex when the wrapping was removed. I am a fan of pus, anaerobic infections, wet gangrene, maggots, you name it. Smells do not phase me. But this was rough! We all had a good laugh about it. Then, off to bed. 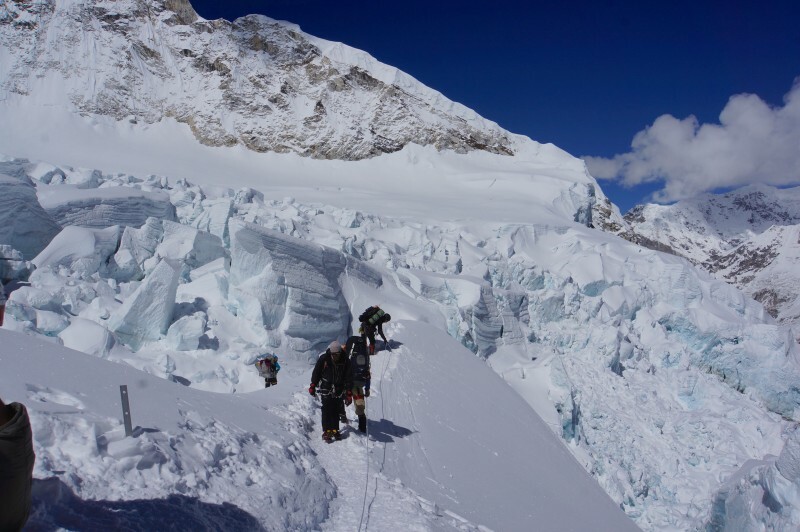 Tomorrow, an acclimatization hike halfway to C2. C1 feels the extreme chill of shadow and dusk. Gad zooks it was cold up there. Everest and Lhotse in alpenglow. wow this is quite awesome video ! Feels like I am really there, without the lack of oxygen ! The blog is really fantastic too. I’m enjoying reading it. Thanks Trina, you are the best. Appreciate your interest and support so much! Loved your pictures!!! They are so beautiful!!!! Looks like you all had fun even tho it wasn’t easy getting there. Loved the comments too!!! The sky is a beautiful blue!!!!! It’s so clear and bright!! !